A site dedicated to learning / teaching quilling or paper filigree art, paper craft, paper flower making, paper cut art and art or craft using paper strips. Learn new quilling techniques through my quilling tutorials, quilling tips, quilling instructions , new quilling techniques, quilled landscapes, quilled flowers, quilled pictures, graphic quilling, quilled flower frames , quilled scenes, paper cut art and paper craft. Quilling Landscapes and graphic quilling nature scenes have become a great favorite with me, since it gives me leeway to try out new techniques in order to create a painting like scene. I cannot paint and have never tried painting so this gives me a chance to practice my artistic skills.I usually quill flowers to break the monotony as I tend to get bored rather quickly!! I have used beehive or what I call honeycomb quilling for the tree top whilst the branches and trunk are graphic quilled. I created two layers in parts of the canopy to get a 3d effect and the top layer is the lightest shade of green. There are three shades of green used in this whole piece. 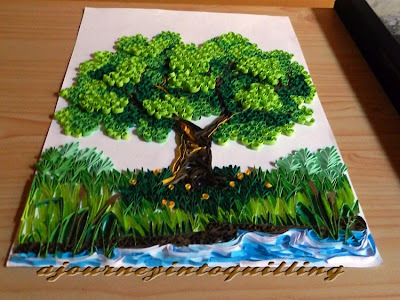 I have used the grass I used in my previous quilled landscape, quilled tree , around the tree (dark green) and for the horizon trees, I used the foliage used in my waterfall landscape and Lion share of love quilled cartoon. The embankment grass is just like what I did in Bambi which is just folded paper pasted to depict grass. Short blue and white strips curled like waves went to create the water. You will be able to see it clearly if you click on the image as I have put a rather large image. Tutorial for Graphic quilling is available here. I enjoyed quilling this one and am happy with the way it turned out. Hope you like it too. Woozer! This is one fine piece of work! Awesome! Wow! Great work!! Beautiful scenery. Good job done...Seems like a Painting!!!!! Oh my !! I just kept staring the leaves,tree and thinking how much time and patience must have gone in it! !This is fabulous. this is gorgeous, love it!!!! Thank You Sylvia,Shylashree,kalnnirmitree creations,Sathya , Georgia, Pooja, Paula,and Shalaka for appreciating this piece. I look forward to reading each of your comments and it makes all the hours of rolling worthwhile. Thanks a million. Thank You. Sorry for the delay in acknowledging your comment. This blog is packed with tutorials , tips, new techniques, how to and instructions on Quilling and show cases my quilled flower frames, landscapes, animals and cartoons. 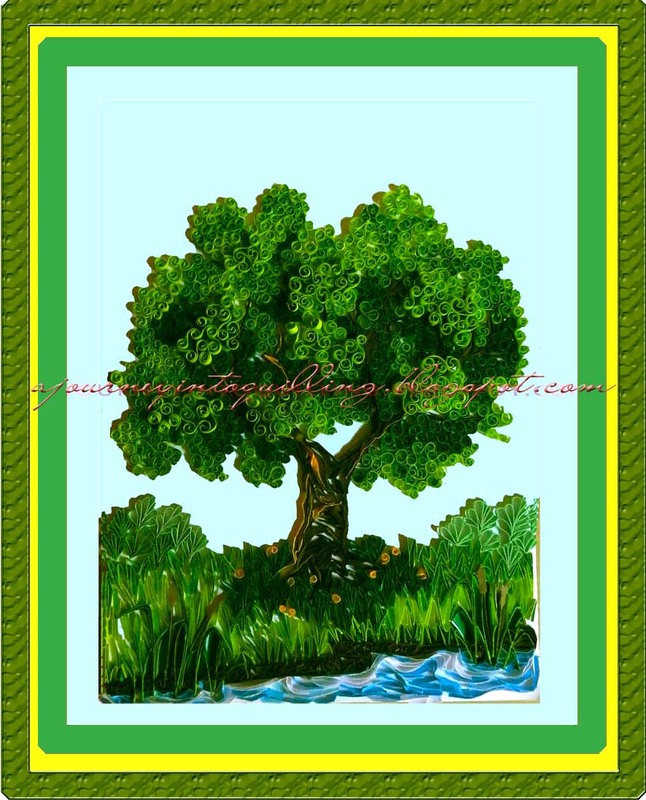 The purpose of this blog is to teach quilling to my fellow travelers as I learn, because I believe knowledge should be free and shared , so every post has descriptions and details of how that frame was made. I will continue posting tutorials on my, new, quilling techniques, as I make my journey of discovery through the wonderland of quilling. Click on "Join This Site" (its Free) to keep abreast of my tutorials and postings on your dashboard or click on "Get Updates by E-mail". DO NOT COPY OR REPRODUCE MY FRAMES - it is a VIOLATION OF COPYRIGHT. You are welcome to try out my techniques , however , please give a link to this blog or to my tutorial to return the favor . That is all I ask of you, for sharing my knowledge with you for free. You can find the best tutorials available on the net, by going thru the "Tutorial Links" page. All the information required to become a great quillist can be accessed by following this blog and its links. This is a Flickr badge showing public photos and videos from ChrisPriya. Make your own badge here. Results of the First Anniversary Challenges! !